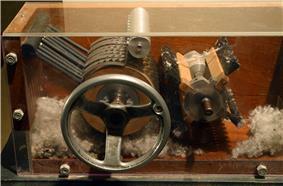 The cotton gin revolutionized Southern agriculture. The technological and industrial history of the United States describes the United States' emergence as one of the most technologically advanced nations in the world. The availability of land and literate labor, the absence of a landed aristocracy, the prestige of entrepreneurship, the diversity of climate and a large easily accessed upscale and literate free market all contributed to America's rapid industrialization. 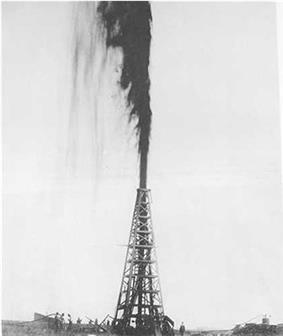 The availability of capital, development by the free market of navigable rivers, and coastal waterways, and the abundance of natural resources facilitated the cheap extraction of energy all contributed to America's rapid industrialization. 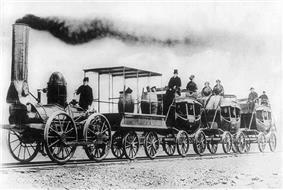 Fast transport by the very large railroad built in the mid-19th century, and the Interstate Highway System built in the late 20th century, enlarged the markets and reducing shipping and production costs. 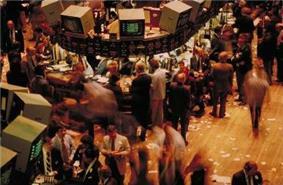 The legal system facilitated business operations and guaranteed contracts. Cut off from Europe by the embargo and the British blockade in the War of 1812 (1807–15), entrepreneurs opened factories in the Northeast that set the stage for rapid industrialization modeled on British innovations. One of the real impetuses for United States entering the Industrial Revolution was the passage of the Embargo Act of 1807, the War of 1812 (1812–1814) and the Napoleonic Wars (1803–1815) which cut off supplies of new and cheaper Industrial revolution products from Britain. The lack of access to these goods all provided a strong incentive to learn how to develop the industries and to make their own goods instead of simply buying the goods produced by Britain. Modern productivity researchers have shown that the period in which the greatest economic and technological progress occurred was between the last half of the 19th century and the first half of the 20th. During this period the nation was transformed from an agricultural economy to the foremost industrial power in the world, with more than a third of the global industrial output. This can be illustrated by the index of total industrial production, which increased from 4.29 in 1790 to 1,975.00 in 1913, an increase of 460 times (base year 1850 - 100). American colonies scale of industrial production. Around the turn of the 20th century, American industry had superseded its European counterparts economically and the nation began to assert its military power. 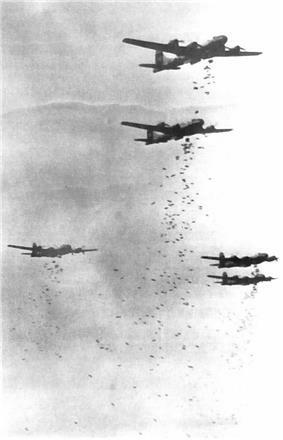 Although the Great Depression challenged its technological momentum, America emerged from it and World War II as one of two global superpowers. In the second half of the 20th century, as the United States was drawn into competition with the Soviet Union for political, economic, and military primacy, the government invested heavily in scientific research and technological development which spawned advances in spaceflight, computing, and biotechnology. North America has been inhabited continuously since approximately 10,000 BC. The earliest inhabitants were nomadic, big-game hunter-gatherers who crossed the Bering land bridge. These first Native Americans relied upon chipped-stone spearheads, rudimentary harpoons, and boats clad in animal hides for hunting in the Arctic. As they dispersed within the continent, they encountered the varied temperate climates in the Pacific northwest, central plains, Appalachian woodlands, and arid Southwest, where they began to make permanent settlements. The peoples living in the Pacific northwest built wooden houses, used nets and weirs to catch fish, and practiced food preservation, although substantial agriculture was not developed. Peoples living on the plains remained largely nomadic (some practiced agriculture for parts of the year) and became adept leather workers as they hunted buffalo while people living in the arid southwest built adobe buildings, fired pottery, domesticated cotton, and wove cloth. Tribes in the eastern woodlands and Mississippian Valley developed extensive trade networks, built pyramid-like mounds, and practiced substantial agriculture while the peoples living in the Appalachian Mountains and coastal Atlantic practiced highly sustainable forest agriculture and were expert woodworkers. However, the populations of these peoples were small and their rate of technological change was very low. Indigenous peoples did not domesticate animals for drafting or husbandry, develop writing systems, or create bronze or iron-based tools like their European/Asian counterparts. In the 17th century, Pilgrims, Puritans, and Quakers fleeing religious persecution in Europe brought with them plowshares, guns, and domesticated animals like cows and pigs. These immigrants and other European colonists initially farmed subsistence crops like corn, wheat, rye, and oats as well as rendering potash and maple syrup for trade. In the more temperate southern climates, large-scale plantations grew labor-intensive cash crops like sugarcane, rice, cotton, and tobacco requiring native and imported African slave labor to maintain. Early American farmers were not self-sufficient; they relied upon other farmers, specialized craftsman, and merchants to provide tools, process their harvests, and bring them to market. Colonial Virginia provided a potential market of rich plantations. At least 19 silversmiths worked in Williamsburg between 1699 and 1775. The best-known were James Geddy (1731–1809) and his brother-in-law William Wadill, also an engraver. Most planters, however, purchased English-made silver. Colonial silverworking was pre-industrial in many ways: many pieces made were "bespoke," or uniquely made for each customer, and emphasized artistry as well as functionality. Silver (and other metal) mines were scarcer in North America than in Europe, and colonial craftsmen had no consistent source of materials with which to work. For each piece of silver they crafted, raw materials had to be collected and often reused from disparate sources, most commonly Spanish coins. 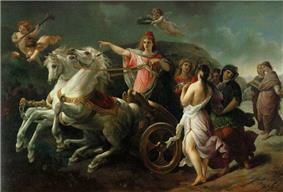 The purity of these sources was not regulated, nor was there an organized supply chain through which to obtain silver. As silver objects were sold by weight, manufacturers who could produce silver objects cheaply by mass had an advantage. Many of these unique, individual aspects to silverworking kept artisanal practices in place through the late 18th century. As demand for silver increased and large-scale manufacturing techniques emerged, silver products became much more standardized. For special-order objects that would likely only be made once, silversmiths generally used lost-wax casting, in which a sculpted object was carved out of wax, an investment casting was made, and the wax was melted away. The molds produced in this manner could only be used once, which made them inconvenient for standard objects like handles and buckles. Permanent mold casting, an industrial casting technique focused on high-volume production, allowed smiths to reuse molds to make exact replicas of the most commonly used items they sold. In creating these molds and developing standardized manufacturing processes, silversmiths could begin delegating some work to apprentices and journeymen. For instance, after 1780, Paul Revere’s sons took on more significant roles in his shop, and his silver pieces often included wooden handles made by carpenters more experienced with woodwork. For even some of the most successful artisans like Revere, artisanry was not a profitable enterprise compared to mass-production using iron or bronze casting. Creating products that could be replicated for multiple customers, adopting new business practices and labor policies, and new equipment made manufacturing more utilmately efficient. These changes, in tandem with new techniques and requirements defined by changing social standards, led to the introduction of new manufacturing techniques in Colonial America that preceded and anticipated the industrial revolution. Late in the colonial era a few silversmiths expanded operations with manufacturing techniques and changing business practicesThey hired assistants, subcontracted out piecework and standardized output. One individual in the vanguard of America's shift towards more industrial methods was Paul Revere, who emphasized the production of increasingly standardized items later in his career with the use of a silver flatting mill, increased numbers of salaried employees, and other advances. Still, traditional methods of artisanry remained, and smiths performed a great deal of work by hand. The coexistence of the craft and industrial production styles prior to the industrial revolution is an example of proto-industrialization. The textile industry, which had previously relied upon labor-intensive production methods, was also rife with potential for mechanization. In the late 18th century, the English textile industry had adopted the spinning jenny, water frame, and spinning mule which greatly improved the efficiency and quality of textile manufacture, but were closely guarded by the British government which forbade their export or the emigration of those who were familiar with the technology. 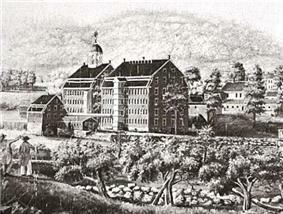 The 1787 Beverly Cotton Manufactory was the first cotton mill in the United States, but it relied on horse power. Samuel Slater, an apprentice in one of the largest textile factories in England, immigrated to the United States in 1789 upon learning that American states were paying bounties to British expatriates with a knowledge of textile machinery. With the help of Moses Brown of Providence, Slater established America's oldest currently existing cotton-spinning mill with a fully mechanized water power system at the Slater Mill in Pawtucket, Rhode Island in 1793. Slater went on to build several more cotton and wool mills throughout New England, but when faced with a labor shortage, resorted to building housing, shops, and churches for the workers and their families adjacent to his factories. Slater's Mill was established in the Blackstone Valley, which extended into neighboring Massachusetts, (Daniel Day's Woolen Mill, 1809 at Uxbridge), and became one of the earliest industrialized region in the United States, second to the North Shore of Massachusetts. Slater's business model of independent mills and mill villages (the "Rhode Island System") began to be replaced by the 1820s by a more efficient system (the "Waltham System") based upon Francis Cabot Lowell's replications of British power looms. The first power looms for woolens were installed in 1820, at Uxbridge, Massachusetts, by John Capron, of Cumberland, Rhode Island. These added automated weaving under the same roof, a step which Slater's system outsourced to local farms. Lowell looms were managed by specialized employees, employed with unmarried young women ("mill girls"), and owned by a corporation. Unlike the previous forms of labor (apprenticeship, family labor, slavery, and indenture), the Lowell system popularized the concept of wage laborer who sells his labor to an employer under contract—a socio-economic system which persists in many modern countries and industries. The magnitude of the transportation problem was such, however, that neither individual states nor private corporations seemed able to meet the demands of an expanding internal trade. 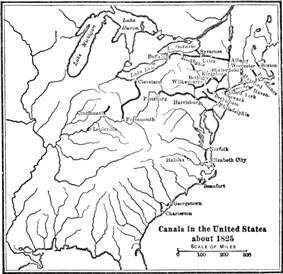 As early as 1807, Albert Gallatin had advocated the construction of a great system of internal waterways to connect East and West, at an estimated cost of $20,000,000 ($322,136,364 in 2014 consumer dollars). But the only contribution of the national government to internal improvements during the Jeffersonian era was an appropriation in 1806 of two percent of the net proceeds of the sales of public lands in Ohio for the construction of a national road, with the consent of the states through which it should pass. 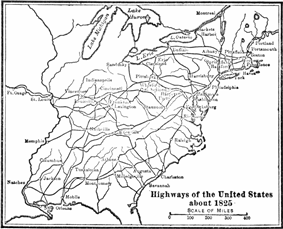 By 1818 the road was open to traffic from Cumberland, Maryland, to Wheeling, West Virginia. In 1816, with the experiences of the war before him, no well-informed statesman could shut his eyes to the national aspects of the problem. Even President Madison invited the attention of Congress to the need of establishing "a comprehensive system of roads and canals". Soon after Congress met, it took under consideration a bill drafted by Calhoun which proposed an appropriation of $1,500,000 ($20,844,118 in 2014 consumer dollars) for internal improvements. Because this appropriation was to be met by the moneys paid by the National Bank to the government, the bill was commonly referred to as the "Bonus Bill". But on the day before he left office, President Madison vetoed the bill because it was unconstitutional. The policy of internal improvements by federal aid was thus wrecked on the constitutional scruples of the last of the Virginia dynasty. Having less regard for consistency, the House of Representatives recorded its conviction, by close votes, that Congress could appropriate money to construct roads and canals, but had not the power to construct them. As yet the only direct aid of the national government to internal improvements consisted of various appropriations, amounting to about $1,500,000 for the Cumberland Road. 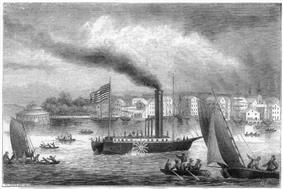 As the country recovered from financial depression following the Henry Clay. He called the attention of his hearers to provisions made for coast surveys and lighthouses on the Atlantic seaboard and deplored the neglect of the interior of the country. Of the other presidential candidates, Jackson voted in the Senate for the general survey bill; and Adams left no doubt in the public mind that he did not reflect the narrow views of his section on this issue. Crawford felt the constitutional scruples which were everywhere being voiced in the South, and followed the old expedient of advocating a constitutional amendment to sanction national internal improvements. Waters, Deborah (1977), From Pure Coin: The Manufacture of American Silver Flatware 1800-1860. ^ Field, Alexander (2004). "Technological Change and Economic Growth the Interwar Years and the 1990s". ^ Field, Alezander J. (2007). "U.S. Economic Growth in the Gilded Age, Journal of Macroeconomics 31". pp. 173–190. ^ "Industrial Production Index". National Bureau of Economic Research. Retrieved 2007-08-03. ^ Harold Gill, "Colonial Silver and Silversmiths," Virginia Cavalcade (1970) 18#3 pp 5-13. ^ Barbara McLean Ward, "Hierarchy and Wealth Distribution in the Boston Goldsmithing Trade, 1690-1760," Essex Institute Historical Collections (1990) 126#3 pp 129-147. ^ Gordon, Robert B (1996). American Iron 1607-1900. Baltimore and London: Johns Hopkins University Press. ^ Dilts, James D. (1996). The Great Road: The Building of the Baltimore and Ohio, the Nation's First Railroad, 1828–1853. Palo Alto, CA: Stanford University Press. p. 305. ^ Eric Weisstein's World of Scientific Biography. "Benjamin Franklin (1706–1790)". Retrieved 2007-03-09. ^ American Institute of Physics. "Benjamin Franklin 1706-1790". Retrieved 2007-03-09. ^ *Nye, David E. (1990). Electrifying America: Social Meanings of a New Technology. Cambridge, MA, USA and London, England: The MIT Press. ^ Charnov, Bruce H.; Patrick J. Montana. Management. Barron's Educational Series, Inc. p. 493. ^ 30,000 acres (120 km²) of federal land, either within or contiguous to its boundaries, for each member of Congress the state had as of the census of 1860 - a minimum of 90,000 acres (360 km²). 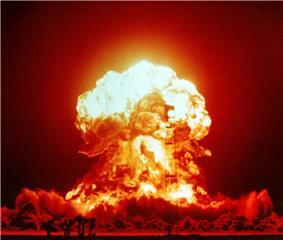 "Backgrounder on the Morrill Act". International Information Programs, U.S. Department of State. Retrieved 2007-03-17. ^ "No. HS-21. 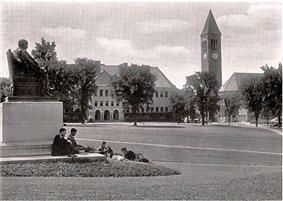 Education Summary—High School Graduates, and College Enrollment and Degrees: 1900 to 2001" (PDF). Retrieved 2007-03-18. ^ "The Benefits of Medical Research and the Role of the NIH" (PDF). Retrieved 2007-03-19. ^ Neil Osterweil (September 20, 2005). "Medical Research Spending Doubled Over Past Decade". MedPage Today. Retrieved 2007-03-19. Research conducted by universities, hospitals, and corporations also contributes to improvement in diagnosis and treatment of disease. NIH funded the basic research on Acquired Immune Deficiency Syndrome (AIDS), for example. Many of the drugs used to treat this disease have emerged from the laboratories of the American pharmaceutical industry. Molecular genetics and genomics research have revolutionized biomedical science. In the 1980s and 1990s, researchers performed the first trial of gene therapy in humans and are now able to locate, identify, and describe the function of many genes in the human genome. As in physics and chemistry, Americans have dominated the Nobel Prize for National Institutes of Health funded 36% of medical research in the U.S. Funding by private industry increased 102% from 1994 to 2003. 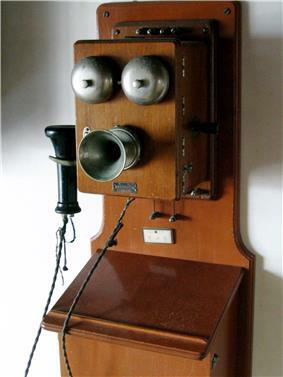 American researchers made fundamental advances in telecommunications and information technology. For example, AT&T's Bell Laboratories spearheaded the American technological revolution with a series of inventions including the light emitting diode (LED), the transistor, the C programming language, and the UNIX computer operating system. SRI International and Xerox PARC in Silicon Valley helped give birth to the personal computer industry, while ARPA and NASA funded the development of the ARPANET and the Internet. Companies like IBM and Apple Computer developed personal computers while Microsoft created operating systems and office productivity software to run on them. With the growth of information on the World Wide Web, search companies like Yahoo! and Google developed technologies to sort and rank web pages based on relevance. 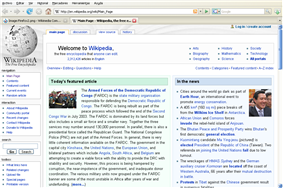 The web also has become a site for computer-mediated social interactions and web services like MySpace, Facebook, and Twitter are used by millions to communicate. Miniaturization of computing technology and the increasing pervasiveness and speed of wireless networks had led to substantial adoption of mobile phones and increasingly powerful smartphones based on software platforms like Apple's iPhone and Google's Android. 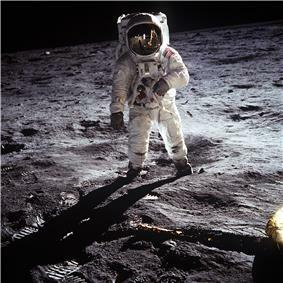 From those first tentative steps, to the 1969 Apollo program landing on the Moon, to today's reusable Space Shuttle, the American space program has brought forth a breathtaking display of applied science. Communications satellites transmit computer data, telephone calls, and radio and television broadcasts. Weather satellites furnish the data necessary to provide early warnings of severe storms. The Progressive movement and the Progressive Era that emerged from it was in part a reaction to excesses of the new industrial age. "Muckraking" journalists reported on a wide array of social issues, and the reaction of the public lent urgency to reforms that led to increased government regulation, such as the Meat Inspection Act and Pure Food and Drug Act (1906). As the nation deepened its technological base, old-fashioned artisans and craftsmen became "
Railroads allowed harvests to reach markets more quickly and The Grange and Farmers Alliance emerged to demand monetary policy that allowed for money supply expansion (as most farmers carried significant debt from planting time to harvest time), railroad regulations, and protective tariffs. In the 1840s, as more and more western states joined the Union, many poor and middle-class Americans increasingly agitated for free land in these large, undeveloped areas. Early efforts to pass a Homestead Act by Horace Greeley were stymied by Southern states who feared that free land would threaten the plantation system. The Homestead Act was passed in 1862 after the opposing Southern states had seceded. The Homestead Act granted 160 acres (65 hectares) to farmers who lived on the land for 5 years or allowed the farmer to purchase the land after 6 months for $1.25 per acre ($3/ha). With growth of American automobile usage, urban and rural roads were gradually upgraded for the new traffic. Local automobile clubs formed the American Automobile Association to lobby city, state, and federal governments to widen and pave existing roads and build limited-access highways. Some federal road aid was passed in the 1910s and 20s (resulting in highways like U.S. Route 1 and U.S. Route 66). The coverage and quality of many roads would greatly improve following Depression-era Works Progress Administration investment in road infrastructure. New Automobile sales were temporarily slowed during World War II when wartime rationing and military production lines limited the number of automobiles that could be manufactured—the largest companies like Ford, GM, and Chrysler would survive those lean years. After the war, rising family sizes, increasing affluence, and government-subsidized mortgages for veterans fueled a boom in single-family homes. Many were automobile-owners. 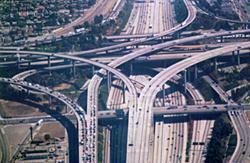 In 1956, Congress passed the Interstate and National Defense Highway Act which provided funding for the construction of 41,000 miles (66,000 km) of toll-free expressways throughout the country laying the legislative and infrastructural foundations for the modern American highway system. Henry Ford revolutionized the automobile manufacturing process by employing interchangeable parts on assembly lines—the beginning of industrial mass production. In 1908, the Ford Motor Company released the Model T which could generate 20 horsepower, was lightweight, and easy to repair. Demand for the car was so great, he had to relocate his assembly plant to Highland Park, Michigan in 1912. The new plant was a model of industrial efficiency for the time: it was well lit and ventilated, employed conveyors to move parts along an assembly line, and workers' stations were orderly arranged along the line. The efficiency of the assembly line allowed Ford to realize great gains in economy and productivity; in 1912, Ford sold 6,000 cars for approximately $900 and by 1916 approximately 577,000 Model T automobiles were sold for $360. 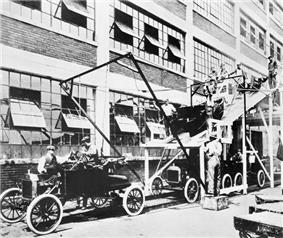 Ford was able to scale production rapidly because assembly-line workers were unskilled laborers performing repetitive tasks. Ford hired European immigrants, African-Americans, ex-convicts, and the disabled and paid comparatively high wages, but was quick to dismiss anyone involved in labor unions or radical political associations. Lord Rothschild, and John Jacob Astor IV) their hydroelectric dam contract over opposition from GE, thereby establishing AC generation and transmission on a large scale as well as creating the 60 Hz standard. In addition to lighting, electric motors (analogous to generators operating in reverse, or using a current to spin a magnet to perform work) became extremely important to industry. Speed control of early DC motors limited their use. 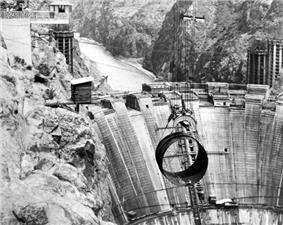 Frank J. Sprague developed the first successful DC motor (ca. 1886) by solving the problem of varying speed with load. Within a few years DC motors were used in electric street railways. In 1888, a Serbian immigrant, Nikola Tesla, a former employee of Edison's, patented an AC induction motor and licensed it to the Westinghouse Corporation. Electric motors eventually replaced steam engines in factories around the nation as they required neither complex mechanical transmissions from a central engine nor water sources for steam boilers in order to operate. Frank Sprague, an electrical engineer who also previously worked for Edison, pioneered the use motors to power electric street carriages in 1888. By the early 1880 generators were beginning to power arc lamps in Britain and France, but they generated high temperatures and sparks that prevented widespread adoption. In 1880, Thomas Alva Edison developed and patented a long-lasting incandescent lamp based upon the previous work of many inventors. Like Bell, Edison immediately set about commercializing his invention through a shrewd business plan involving companies that would manufacture the whole technological system upon which the "light bulb" would depend - generators (Edison Machine Company), cables (Edison Electric Tube Company), generating plants and electric service (Edison Electric Light Company), sockets, and bulbs. As in other industries of the era, these companies achieved greater efficiencies by merging to form a conglomerated General Electric company. Lighting was immensely popular: between 1882 and 1920 the number of generating plants in the US increased from one in downtown Manhattan to nearly 4,000. While the earliest generating plants were constructed in the immediate vicinity of consumers, plants generating electricity for long-distance transmissions were in place by 1900. 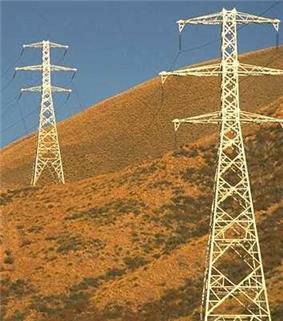 To help finance this great expansion, the utility industry exploited a financial innovation known as the "holding company"; a favorite holding company investment among many was the Electric Bond and Share Company (later much-changed, and known as Ebasco), created by the General Electric company in 1905. The abuse of holding companies, like trusts before it, led to the Public Utility Holding Company Act of 1935, but by 1920, electricity had surpassed petroleum-based lighting sources that had dominated the previous century. Major advances were made by Europeans for the next century. trust that owned and controlled the constituent companies in each state. The use of trusts by other industries to stifle competition and extract monopoly prices led to the 1890 passage of the Sherman Antitrust Act. In the 1911 case of Standard Oil Co. of New Jersey v. United States, the Supreme Court ordered the Standard Oil Trust be disbanded into competing companies that would become Exxon (Standard Oil of New Jersey), Mobil (Standard Oil of New York), and Chevron (Standard Oil of California). The ability to quickly transmit information over long distances would prove to have an enormous impact on many diverse fields like journalism, banking, and diplomacy. Between 1837 and 1844, Samuel F.B. Morse and Alfred Vail developed a transmitter that could send "short" or "long" electric currents which would move an electromagnetic receiver to record the signal as dots and dashes. Morse established the first telegraph line (between Baltimore and Washington D.C.) in 1844 and by 1849 almost every state east of the Mississippi had telegraph service. Between 1850 and 1865, the telegraph business became progressively more consolidated and the 1866 incorporation of Western Union emerged with a near-monopoly over 22,000 telegraph offices and 827,000 miles (1,330,900 km) of cable throughout the country. The telegraph was used to dispatch news from the fronts of the Mexican-American War, coordinate Union troop movements during the Civil War, relay stock and commodity prices and orders between markets on ticker tape, and conduct diplomatic negotiations after the Transatlantic telegraph cable was laid in 1866. In 1868, U.S. Steel earning Carnegie $480 million personally. Throughout the 18th and early 19th centuries, the English steelmakers produced puddling furnaces and cost over £50 per long ton. 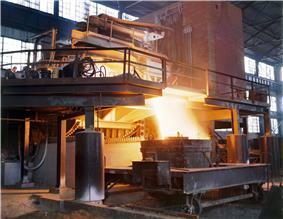 In the 18th century, innovations like steamboats, railroads, and guns increased demand for wrought iron and steel. The Mount Savage Iron Works in Maryland was the largest in the United States in the late 1840s, and the first in the nation to produce heavy rails for the construction of railroads. In the 1850s, American William Kelly and Englishman Henry Bessemer independently discovered that air blown through the molten iron increases its temperature by oxidizing the carbon and separating additional impurities into the slag. The Kelly-Bessemer process, because it reduces the amount of coke needed for blasting and increases the quality of the finished iron, revolutionized the mass production of high-quality steel and facilitated a drastic drop in steel prices and expansion of its availability. Because charcoal, and iron ore and limestone had to be mined and transported. By the end of the 18th century, the threat of deforestation forced the English to use coke, a fuel derived from coal, to fire their furnaces. This shift precipitated a drop in iron prices since the process no longer required charcoal, the production of which was labor-intensive. This was a practice that was later adopted in the US as well.